Home > Arts & Culture > Review > Damned Cannibals! If the psyops of the 2014 referendum taught us anything, it’s that ‘narrative’ isn’t just something relevant to storytellers and fiction writers. A recent article in The Economist (‘In Cawdor’s Shadow — The Soft Autocracy of Nationalist Scotland’, October 17th, 2015) set out to describe the crofters of northern Scotland, but by paragraph two had plunged into a general and unfounded bashing of the Celtic races. This article does exactly what William Hogarth did in his paintings in the 1740s, when the Highlands were morbidly portrayed as lawless, savage and filled with wild Scots. Stereotypes of Highland cannibalism lasted till the mid-18th century and were embraced by English political and anti-Jacobite propaganda. They don’t call Scots cannibals any longer, but this article in The Economist served the same political messaging by refusing to offer fact and genuine reportage. Real journalists after all, interview people and present a balanced analysis. Instead, there is as there has always been, a school of journalism — represented here by The Economist’s ‘Bagehot’ column — which expresses the opinions and desired outcomes of media owners and their own masters. The article was only two columns in extent, but let me show you what I mean. It’s criminal that Jeremy Cliffe’s article, the purpose of which can only be to cement with smugness the pre-formed opinions of his cosmopolitan readers, will spread further than a book which is written by a true native of Caithness, which in poetry, history, geology and myth, tells a truer-by-far story. George Gunn’s new book, The Province of the Cat — A Journey to the Radical Heart of the North, is not a personal account, but includes personal reminiscence and employs his full poetic skills as part of a wide-ranging historical and cultural survey of his home. Gunn doesn’t tackle current narratives head on, but looks at how economic factors which are never local, have hastened the decline and the morale of Caithness. You can read for example about the creation of the herring industry, and the arbitrary forces that it was beholden to, and you get an immediate sense of how the people have been ‘farmed’ in the area as readily as sheep. 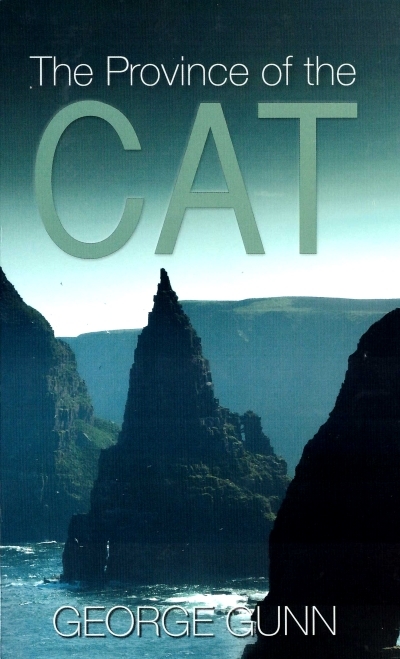 One of Gunn’s concerns is that the cultural richness of Caithness has gone entirely unsung, and in this he redresses the balance in examining many folk tales and legends. He also offers much reflection of the novelist Neil Gunn, as well as his thoughts on the ongoing relationship between the social and the supernatural. In some respects, The Province of the Cat is a deeply pensive book, although it is not mirthless. Caithness’ history is not unlike that of any other area — successive invasions — but the intensity of land-abuse will surprise you. And how long things take to die! When in 1609, ‘James IV demanded that all Highland chiefs sign the statutes of Iona which put down in black and white the range and scope of prejudices against a group of people who spoke a particular language and lived in a certain way,’ little did he know that over 400 years later, the job would require the continued hard-working input of Kelvin MacKenzie and Katie Hopkins — only to find the project still not complete. I think it is these direct measures taken in the past to suppress his culture that irk George Gunn so powerfully, and while it is not in his character to rant and rail, he maintains an odic and songlike melancholy, referenced in history and somehow still alive in the speech (Caithness Scots) which he hears around him — or at least which he heard as a kid. This he combines with poetic descriptions of in particular wildlife — notably the birds — at which he excels. These passages are the greatest in The Province of the Cat, and when Gunn describes geology, birdlife, and in particular a battle he sees between an orca and some seals, he is at his best. Even in terms of what is left — tourism — Gunn regrets the failure of the civic authorities who ‘do not consider the physical lyricism and natural beauty of John O’ Groats to be a marketable asset — there must always be an ‘other’, or something for the tourists to ‘do’. Gunn finds a metaphor for this general decline in the ‘Cave of Gold’ of local legend, which is something that he carries from his own play as a child, and which is a narrative that the entire community carries, at the risk of great loss — the loss being memory, culture and the social benefits of local industry and family units. George Gunn also looks hard at one of the most pressing issues of our own time, in a long discussion of landownership and usage, although in the recurring descriptions of the land and ‘the foreverness of the sea’ it is hard for him to accept that the place is owned by anyone at all — and in this his poetry triumphs. However, if Gunn is right that ‘landscape, like art, is often not about what you see, but what you feel,’ then that explains article like that issued by Jeremy Cliffe in October’s The Economist — they look at Scotland, and feel disgust — they look at the Highlands (empty and uncultivated in their eyes) and feel fear. This is also narrative, but read the Province of the Cat and you will encounter a story which is substantiated, argued and deeply evident from history. What George Gunn says about Caithness rises from a lifetime of observation — it is written from within and that is its power. What a great artcle. Thank you. An excellent article, and another step towards rebutting the grotesque fantasy that the UK media can portray these days. Jings, one day the SNP might even employ Scots to head up Scotland’s arts bodies, its universities, and the hundreds of other publicly funded institutions throughout Scotland. Then the ‘damned cannibals’ will be completely running the place themselves! I often travel through Caithness and can sense the pain. Great stuff, must get George´s book and he´s right, you´re both right, we need myth, we need the power of myth to wake the people. my words will be a prophecy. will be routed as they (the crofters) were. and a time to reward the robbers. …to dream we need the poets, we have far too many politicians. Try as I might, I can’t see how this paragraph can be interpreted as “a general and unfounded bashing of the Celtic races.” It seems pretty much in line with the way that, for example, the Herald reported the story. And though I agree that the Economist article was lamentably short on substantiation and external references, it’s no good dismissing it on the grounds that it merely “expresses the opinions and desired outcomes of media owners and their own masters”, as this is itself an unsubstantiated and unreferenced assumption. The Economist article needs a proper answer. Sadly, this isn’t it. Peter Burnett is right to condemn Bagehot’s article in The Economist (16 October) as its tone is outrageously anti-Scottish. For Anton to dismiss Burnett’s criticism of media bias as an “unreferenced assumption” is, I submit, somewhat unworldly. Right-wing political blogger Paul Staines (a.k.a. Guido Fawkes) says of The Economist, “[it is] nowadays editorially in thrall to the fashionable, guilty, billionaire class that throngs to Davos, adding to global warming with all the hot air they release. This international élite wants to conserve the stable managed form of globalisation that has served them more profitably than a dynamic free trading world order would. Hardly surprising given that [former Economist editor] Micklethwait has been intimately involved with the organisation of the Bilderberg conferences for years. This list illustrates The Economist’s target audience and, by extension, the advertisers it needs to attract. These are the people for whom it writes and for whom, consequentially, its content is tailored. So it tells them what they prefer to hear, which is not necessarily remotely factually accurate. Bagehot’s piece is a case in point. It is yet another example of highly contentious journalism emanating from non-Scottish sources aimed at discrediting both the idea of Scottish independence and any who might support it. Bagehot’s article is riddled with inaccuracy and prejudice. The writer has not done his homework, even at the most basic level. He is content to dress up the received “wisdom” of the fiercely anti-indendence mainstream media as his own considered, insider’s viewpoint by reference only to someone he calls Roddy and a clichéd description of Dingwall mart. Its second column consists almost entirely of untruths, factual errors or contentious emphasis. There’s barely a line free of distortion or incomprehension, to the extent that it is almost beyond measured criticism. (Indeed, comments on The Economist’s web site voice a similar view). It is like being deluged by a rainstorm of poisonous droplets, each needing a different antidote. The entire piece depends almost entirely on assertion : for which he provides no sources, apart from “Roddy” the (surely mythical) crofter and a worthless reference to COSLA that lacks any context whatsoever. I also agree with Peter Burnett in his condemnation of the article. Anton, perhaps there is some form of barrier (e.g. social, cultural, etc.) preventing you from seeing the rather obvious anti-Scottish nature of the Economist article? Astragael: Frankly, I don’t take Guido Fawkes’ opinions as evidence of anything, except his opinions. And that’s all they are – opinions. Nor do I accept that the Economist can be dismissed because, you say, “it tells its readers…what they prefer to hear”. Well, so does the Rev Stu, but I wouldn’t dismiss Wings on these grounds either. Alf Baird: No, I don’t think the Economist article is anti-Scottish. Rather, it’s bitterly anti-SNP, and it’s opposed to the current Scottish Government. That’s entirely different from being anti-Scottish. If you agree with Peter Burnett that the second paragraph of the Economist article, which I quote above, is “a general and unfounded bashing of the Celtic races” then by all means point out to me where it says that. I was trying (and clearly failing) to make another point entirely. I completely agree with both of you that the Economist article is based on unsubstantiated and unreferenced assertions. These need to be challenged. But accusations of bias and anti-Scottish sentiment aren’t arguments. Without evidence, they’re simply assertions in the eye of the beholder, and can be too easily dismissed on the grounds that “nationalists would say that, wouldn’t they?”. If we are to win the debate on Scottish Independence, we have to argue on the basis of the evidence, and it’s on that basis that the Economist article needs to be refuted. Anton, you do make a good point, however the Economist seems to ignore that Scots people elected the SNP government in what is a fairer electoral system than Westminster and although few of us are happy with all things the SNP do, the alternatives are just not worth thinking about. By the way, having read the Economist article again, there seems to be a number of strong clues there which suggests it may have been drafted initially by the only Scottish politician mentioned by name in it. As you imply, it reads like a political anti-SNP rant. Scots appear to have no problem pronouncing ‘Calder’. Tragic all the same.